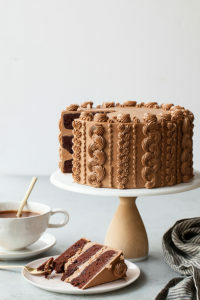 Chocolate Toffee Crunch Cake – fudgy chocolate cake lightly spiced with cinnamon paired with crunchy toffee bits and silky smooth chocolate buttercream frosting. Preheat the oven to 350F. Grease and flour three 8-inch round pans and set aside. Place the coffee, butter, and cocoa in a saucepan and melt over medium-low heat. Stir to combine and remove from the heat. Meanwhile, stir together the eggs, buttermilk, oil, and vanilla. Set aside. In a large mixing bowl, whisk together the flour, sugar, baking soda, baking powder, salt, and cinnamon. Add the cocoa mixture and stir to combine. Add the buttermilk mixture and whisk until the batter is smooth. Evenly distribute the cake batter into the prepared pans. Bake in the pre-heated oven for 30 to 35 minutes, or until a toothpick inserted into the center of the cakes comes out clean. Cool the cake on a wire rack for 15 to 20 minutes before removing the cakes from their pans. Cool completely before filling and frosting. Place the egg whites and sugar in the bowl of an electric mixer. Gently whisk until combined. Place mixing bowl over a pan of simmering water to create a double-boiler. Whisking constantly, heat the egg mixture until it registers 160 degrees on a candy thermometer. Carefully transfer the bowl back to the stand mixer. Using the whisk attachment, whip the egg mixture on high for 8 to 10 minutes until stiff, glossy peaks and the outside of the mixing bowl returns to room temperature. Switch to the paddle attachment. With the mixer on low, slowly add the butter (a couple tablespoons at a time) and mix until incorporated. Add vanilla. Whip on medium until silky smooth, about 3 to 5 minutes. Add in the melted chocolate and mix until smooth. Line a baking sheet with a piece of parchment or a silicone mat and set aside. Melt the butter in a saucepan over medium heat. Stir in the sugar and bring to a boil. Whisking constantly, continue to cook until golden (about 5 minutes). Remove from the heat and stir in the cinnamon and salt. Immediately pour the toffee mixture onto the prepared baking sheet and quickly spread into a think layer with an offset spatula before the toffee sets. Allow to cool and break into tiny pieces before using. Place the sugar and water in a saucepan and bring to a boil over medium-high heat. Reduce the heat down to a simmer and add in the cinnamon stick. Simmer on low for 5 to 10 minutes. Remove from the heat and allow to cool. Strain out the cinnamon stick before using. Brush the cake layers with warm cinnamon syrup (gently reheat in the microwave, if needed). Place the bottom layer of cake on a cake board or serving dish. Dollop on ¾ cup of buttercream and spread with an offset spatula. Sprinkle on a generous amount of toffee bits (about 1/3 cup) and gently press into the buttercream. Add a small amount of buttercream on top (about ¼ cup) and spread to secure the toffee bits. Place the next layer of cake on top and repeat. Smoothly frost and decorate with the remaining frosting. Use star and round piping tips to create different patterns to mimic knit on the sides of the cake. DO: Have fun and get creative!